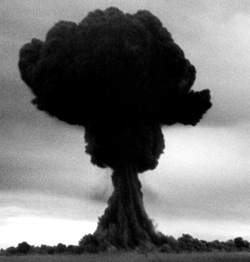 The Russians detonate their first atomic bomb at Semipalatinsk, Kazakh SSR and become the second nuclear power. The United States was startled at having lost their nuclear monopoly so soon. Julius and Ethel Rosenberg became the first American civilians executed for espionage after having been convicted of passing nuclear weapons secrets to the Soviet Union. The Soviet Union's first atomic bomb was comparable to America's Gadget and Fat Man with an explosive force of 22 kilotons of TNT. It was an implosion type weapon with a solid plutonium core. 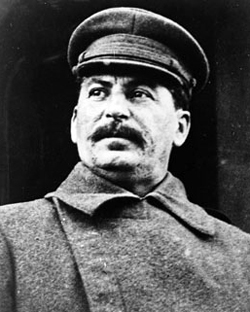 The United States gave it the code name of Joe 1, after Joseph Stalin. The alliance between the Western democracies and the Soviet Union during the war with Germany was always a matter of necessity, the marriage of convenience. The leaders of East and West shared few convictions and regarded each other with suspicion. 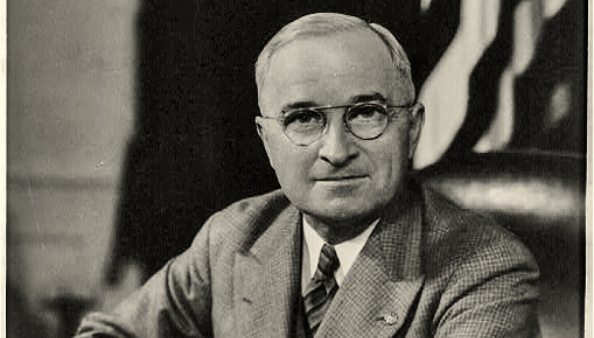 Development of the atomic bomb was not a matter to be trusted with Stalin's Russia although the Soviet leader had his own sources within the Manhattan Project and displayed little emotion when America's President Truman spoke of a miraculous new weapon during their meeting in Potsdam. The lessons learned from the Great Patriotic War meant Russia was safe being second to no one and no Soviet leader, especially Stalin, would tolerate a world of American nuclear hegemony. 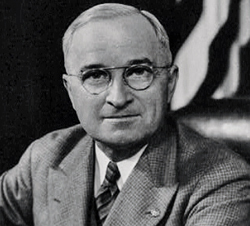 Fear of Nazi Germany led to the development of the atomic bomb but with Berlin's surrender and bitter conflict continuing in the Pacific it seemed only natural to President Truman for him to order the use of this weapon in hopes of bringing the war with Japan to an end. Japan's unconditional surrender following the destruction of Hiroshima and a second atomic attack on Nagasaki brought a rapid demobilization of American military forces. Yet events quickly demonstrated that the perceived interests of the United States and those of the Soviet Union were in direct conflict. 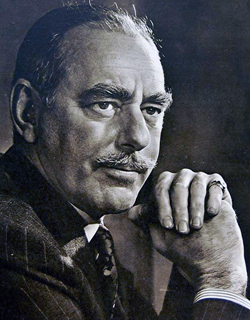 Secretary of State Dean Acheson had not anticipated military action by Communist forces in North Korea when he placed South Korea outside America's vital interests. Stalin, in turn, was surprised by the determined military response of the United States to developments on the Korean peninsula. Both countries quickly learned it was dangerous to miscalculate the other. The Korean War more than any other single event made clear a Cold War did exist between the globe's two emergent super powers. 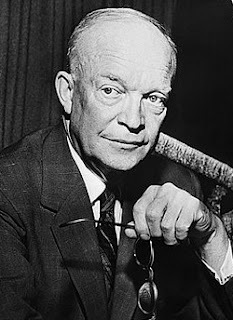 President Dwight Eisenhower, famed for overseeing the successful amphibious assault at Normandy in 1944, was determined to keep military costs to a minimum by relying on the threatened use of nuclear weapons in response to any military move on Western Europe by the Soviet Union's still large conventional army. Nuclear bombs and the means of delivering them was vastly cheaper than maintaining armed divisions. 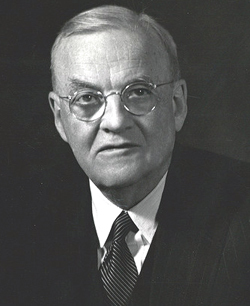 The ardent anti-Communist John Foster Dulles, Secretary of State under Dwight Eisenhower, was a strenuous proponent of massive retaliation, believing that releasing unrestrained force was the best deterrence to aggression. During the course of the 1950s Russia's own massive retaliatory power grew placing increased dependence on the credibility of America's nuclear threat. Citizens of Berlin, for instance, could only wonder whether the United States government was willing to risk destruction of its own cities in defense of this German city isolated deep within the Communist block. General Maxwell Taylor, Army Chief of Staff under Eisenhower, called for a Strategy of Flexible Response. 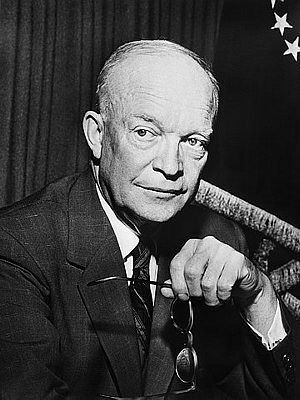 His argument for an American military capable of handling threats with conventional weapons would require enormous increases in defense spending and his belief in funding the means to fight limited wars found a receptive ear only when John Kennedy entered the White House. 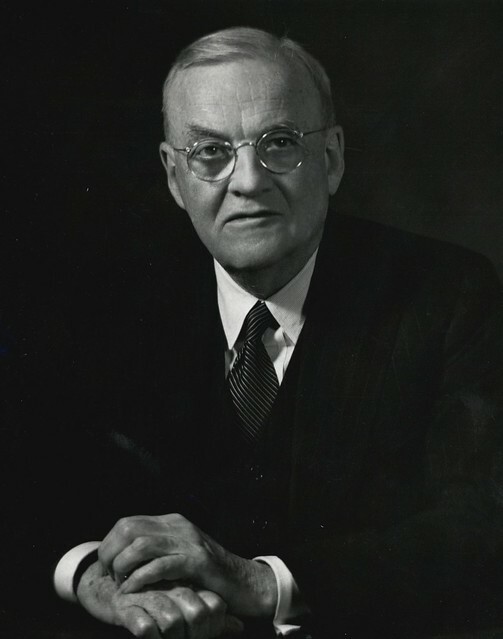 Within a couple of years President Kennedy introduced American troops into Southeast Asia and Maxwell Taylor would serve briefly as Ambassador to South Vietnam. 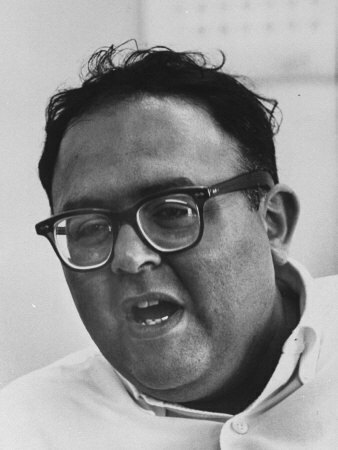 Herman Kahn made his reputation for speaking the unthinkable while employed at the RAND Corporation whose mission it was to freely explore the range of options available in thermonuclear war. His detached approach to gaming the catastrophic made him the basis for the bizarre, mad character that was the centerpiece of the motion picture Dr. Strangelove. 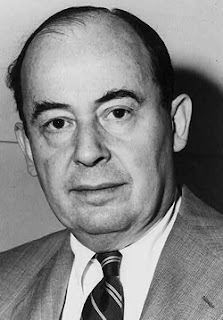 Two less flamboyant colleagues of Herman Kahn at the RAND Corporation were the celebrated mathematicians John von Neumann and Oskar Morgenstern. Their work in game theory led them to believe in the ultimate interdependence of the United States and the Soviet Union. The two nation's fates were linked and the decision making of each would ultimately require keeping the interests of their potential enemy always in mind in order to prevent antagonisms from getting out of hand. 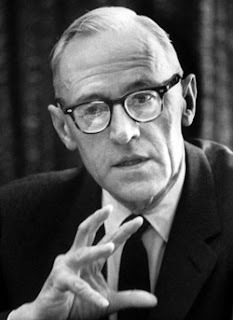 A practical application of this mindset occurred in the peaceful remedy to the Cuban Missile Crisis where each side avoided backing the other into a corner. 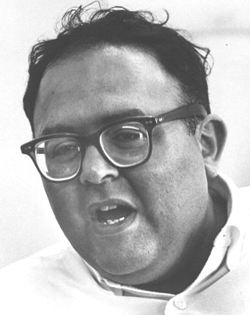 This obscure Harvard professor gained national attention with the publication of his book, Nuclear Weapons and Foreign Policy, in which he argued that military means and diplomatic approaches are not separate ventures but interrelated when arbitrating differences between confrontational nations. 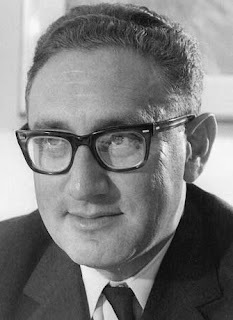 Kissinger would become a seminal adviser to Richard Nixon during a period of relative rapprochement between America and her Cold War adversaries China and the Soviet Union. 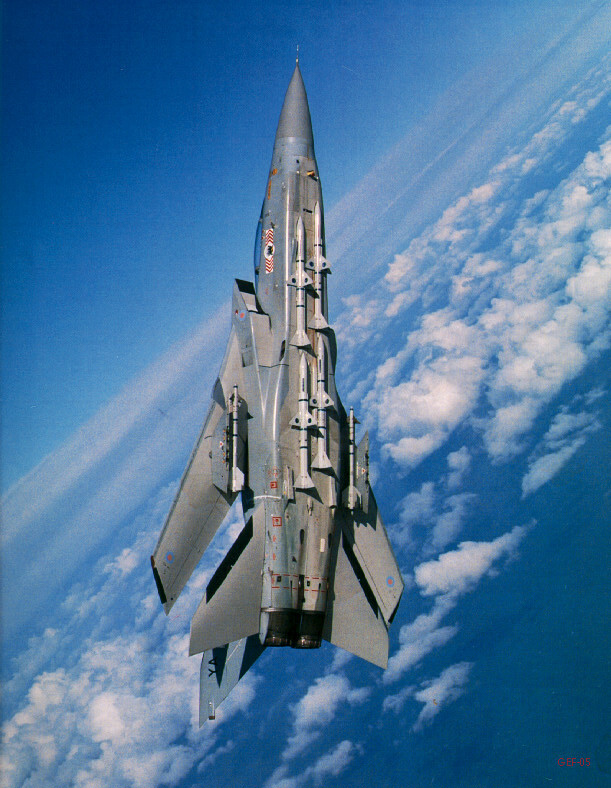 The all-weather, low-level strike aircraft Tornado was the joint effort of the UK, Italy and Germany initiated in the early 1970s in the midst of the Cold War. With nearly 1,000 aircraft produced the economies of scale made up for duplications in the multiple country effort. Variations were produced to meet the different country's specific needs. The photo is 800 x 600 and is at SiaPhoto. 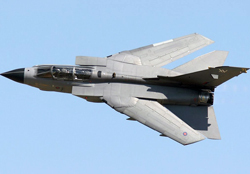 The Tornado is designed for optimized flight at three wing positions: 25 degrees with wing slats and flaps extended provide high lift for short take off and landing capability; 45 degrees for normal flight operation; 67 degrees to achieve maximum speed. The photo is 1100 x 775 and is posted at Reddit. 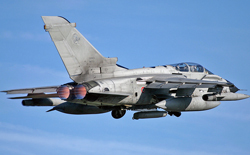 Built for rapid, low level penetration of enemy airspace the Tornado remains, after thirty years, the backbone of Britain's air strike capability. Coming in close to the deck to crater the runways of Iraq's heavily defended airbases contributed to the loss of six Tornados during Desert Storm. 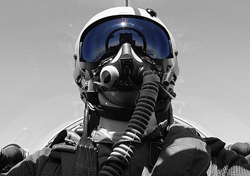 Piloting your nation's most advanced combat aircraft means being assigned missions with the highest risk. The photo above is from Patrick's Aviation. The Tornado was intended to come in low, under the cover of darkness, even adverse weather and strike its target with precision. It's not a nimble craft. Don't expect the upper hand in a close quarters dogfight. It's fast but massive and has lumbering brutish power. But lumbering doesn't describe the ride you feel flying tree top level through mountain passes at nearly 1,000 kph / 600 mph... in nasty weather. It's that good. 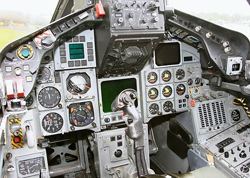 Blistering thrust, cutting edge avionics and reliable terrain following radar are packaged in the Tornado. The picture is 640 x 426 at 180 dpi and is from a posting on Flickr. Even with a weapons officer riding tandem there is no lack of things to know, monitor and do while piloting the Tornado. 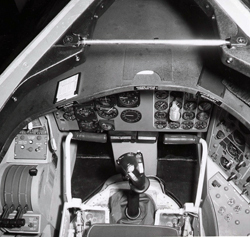 There's a steep learning curve that goes with moving into this cockpit from a less sophisticated aircraft. Looking at it another way it's sitting in your favorite arm chair with all your toys carefully arranged in front of you. Don't bother me. I'm having fun. 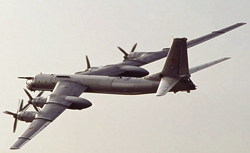 The photo is from Air Team Images and is 600 x 420. 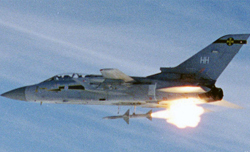 The above photo displays the ordnance of a Tornado ADV, designed during the Cold War to intercept Soviet long range bombers and destroy them before they could fire their stand off missiles at British targets. 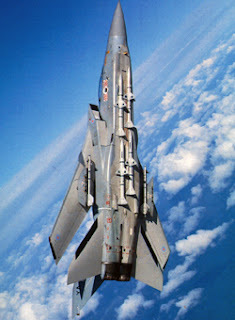 The missiles nestled tight against the fuselage are BAe Sky Flash radar guided air-to-air missiles. The wing mounted missiles are heat seeking Sidewinders. The image is 611 x 788 and is posted at Reddit. The HARM, or High-speed Anti-radiation Missile, is an air-to-surface missile that follows the electronic transmission of a radar system to its source and detonates. 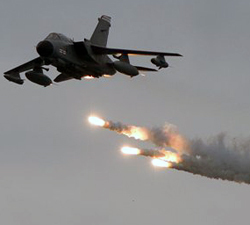 Defense suppression is another role of the Tornado along with air interdiction, close air support of troops. high value target ground attack, maritime anti-ship patrol, and reconnaissance. Each of the varied combat missions has its own weapon specific to the task. The image is from Military Today and is 1024 x 538. Low level ground attack means vulnerability to small arms fire and shoulder launched heat seeking missiles. Flares are a reliable counter to the latter. 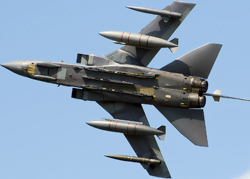 With precision weapons and stand off missiles that are accurately launched at considerable distance from the target, low to the ground flight tactics aren't the necessity once required of Tornado pilots. Still, like dogfighting, these are skills that remain in the training because warfare is a venture that often defies prediction. The photo is 500 x 332 at 96 dpi and is from Flight Global. Saudi Arabia has three squadrons of Tornados adding to the F-15Cs they already have in the role of air defense. The aircraft are not the junior version often found in export sales but are as capable as any Tornado found in the RAF. 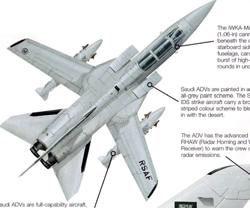 Saudi Arabia was the only country outside the original three manufacturing nations to receive the Tornado. The 1435 x 903 graphic is from Wings Palette. 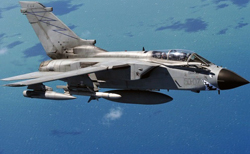 The Tornado was used in the recent Libyan engagement and it has so far avoided retirement. But plans are to replace it with the Eurofighter Typhoon and, later, the F-35 Lightening as it becomes available. The question is what follows this next generation of combat aircraft? With the rapid technological advances of UAV, Unmanned Aerial Vehicles, what role will on-board pilots have in future aviation? For instance, a human may tolerate a 9 G force but an aircraft can handle far more. We aren't yet to the point of turning mission critical assignments over to machines, software and an individual in a cubicle with a joystick. But as technology progresses human biology will increasingly become the glaring limiting factor and the lone pilot in a cockpit will join the cowboy on the range and the white knight on horseback as another romantic image for the ages. The above picture is 1024 x 678 and is at Military Today. 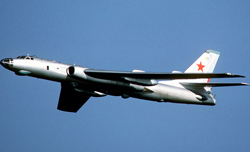 Developed in the early 1950s the Tu-16 was the Soviet equivalent of the American B-47. Its two large engines produced thrust equivalent to that generated by the six J47 engines on the Boeing. It had a very good airframe and it was adapted beyond the bomber role over the years to include maritime reconnaissance and aerial tanker. The above photo is 800 x 550 and is from Military Factory. Any hope the U.S. had of preventing Western Europe from being overrun by Warsaw Pact conventional forces required maintaining open sea lanes with North America. 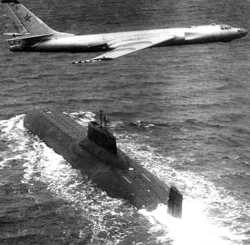 The Tu-16 armed with the AS-6 'Kingfish' long-range nuclear missile threatened to knock out America's carrier battle groups in the Atlantic. A scenario such as this would quickly lead to an exchange of ICBMs between the two warring super powers. The resulting destruction of the two society's cities and industrial capacity rendered these actions suicidal. The illustration is 1000 x 667 at 28 dpi and is by Johan Franken. 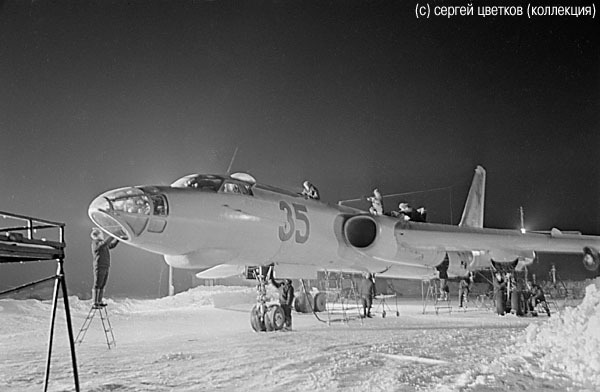 A freezing winter night and this Russian ground crew is doing what needs to be done. When you hear talk of military readiness think of measures such as these. Critical military assignments wouldn't be described as comfortable or convenient by those charged with carrying them out. The photo above is 600 x 392 at 96 dpi and is from Air Force, Russia. Always snoop, always test the readiness of the other side. This would be a familiar sight during the Cold War. The pods beneath the wings of this Tu-16 reveals its mission of ELINT - Electronic Intelligence gathering. Additional reconnaissance capability is provided by the bubbles seen under the fuselage. 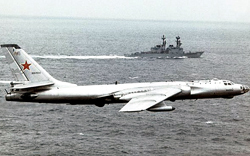 It may seem a bit unnerving to Navy ships but this Tu-16R isn't the lethal Tu-16K-10, armed with ship-killing missiles. The picture is 849 x 503 at 300 dpi and is from Global Security. This Badger is flying over the very large Russian Typhoon Class missile-firing nuclear submarine. These are the largest submarines ever made and they house 20 missiles. The protrusion from the end of the Tu-16's wing is for aerial refueling - a unique wingtip to wingtip method of transferring fuel between a Tu-16N tanker and the Badger. The photo is 600 x 800 and is at Webshots. 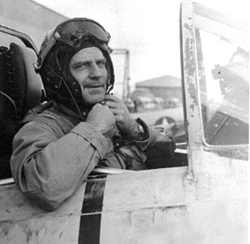 A typical Badger crew consisted of pilot, co-pilot, navigator and flight engineer in the front crew compartment and a ventral and tail gunner in the rear compartment. 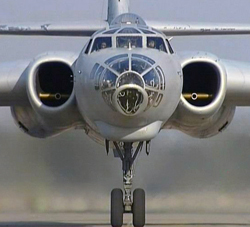 Reconnaissance Tu-16s may well have an addition two to three crew members dedicated to intelligence gathering. The above Badger has an enlarged radome for improved search and target tracking. The photo is 1348 x 1004 at 300 dpi and is from Panoramio. 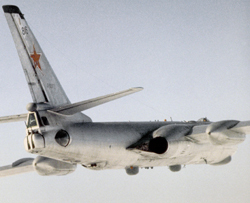 The Tu-16 lasted twenty years beyond its contemporary, the B-47, because it proved to be a versatile platform. It was designed to deliver the Soviet Union's largest nuclear weapon but its limited range prevented it from being a true strategic bomber. 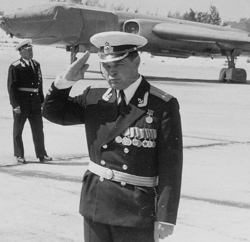 Several Tu-16s were sold to Egypt over the years. The initial group was mostly destroyed on the ground by Israeli pilots at the beginning of the 1967 Six-Day War. 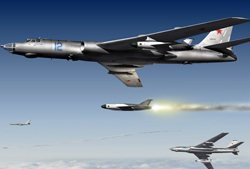 The Tu-16 fared better in the 1973 Yom Kippur War as they were able to launch 25 missiles at Israeli targets. The 1742 x 1210 at 96 dpi graphic above is from Soviet Hammer. China built the Tu-16 under license and is the only country known to continue operating this aircraft. Besides Egypt, Iraq and Indonesia had also purchased the Badger for their air force. 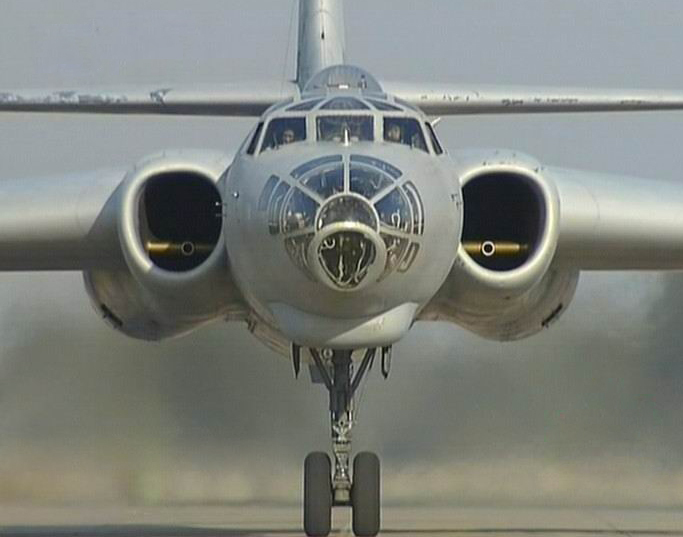 The Tu-22 Blinder was the intended replacement for the Badger but while it was faster its range was disappointing and production was limited. Some of the Blinders would eventually be sold to Libya. The photo is 683 x 537 and is posted at Reddit. The Tupolev Badger was a swept wing bomber that retained World War II concepts with a tail gunner and both dorsal and ventral gun emplacements like those found on the B-29. Germany's defeat in 1945 eliminated the need for cooperation between the wartime allies, Russia and the United States. The rivalry between the two dominant powers extended beyond ideological differences. The tension of the Cold War has abated but frictions will remain between the two nations as demonstrated by their competing interests with countries like Iran. China has grown in global stature as has Western Europe. The 21st Century has begun much like the first years of the 20th Century when newly powerful nations confronted established nations for greater access to economic resources and increased political influence. It remains to be seen whether the upcoming jostling for dominance can be limited to peaceful competition. The picture above is 2585 x 1832 at 259 dpi and is at Ramapo College. 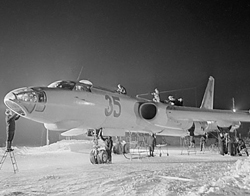 It was the world's first operational supersonic bomber, capable of sustained Mach 2 speeds for up to an hour. Yet, within a decade it was retired from service. 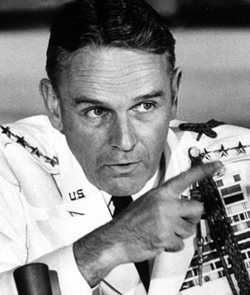 SAC, the Strategic Air Command, was never happy with its modest range and its maintenance costs seemed exorbitant against the financial drain that was Vietnam. Finally, its inflexible strategic role was viewed superfluous with ICBMs being the more credible deterrent to nuclear war. The illustration above is 400 x 281 and 300 dpi. It is from World War II Aces. 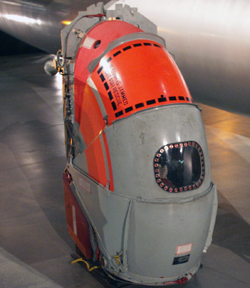 There was no room for a conventional bomb bay in the narrow Coke bottle shaped fuselage so ordnance was kept within a large, streamlined centerline weapons pod tucked beneath the aircraft. 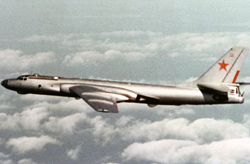 The pod's size required the B-58 to have long, mosquito legged landing gear. A wartime mission would normally include five atomic weapons, one for each assigned target. Actual missions would require at least one in flight refueling with a KC-135 tanker. The photo is from Strange Cosmos and is 621 x 441. Engine pods were mounted outboard of the thin delta wing which had a 60 degree sweep. The speed of the aircraft was not limited by power but by allowable inlet air temperatures and the structural integrity of the aircraft. Sharp cones or spikes protruding from the jets prevented sonic shock waves from entering the engine intakes and disrupting air flow and power. The 750 x 583 image is from Fighter Plane Photos. Each of the three crew members was isolated in their own separate compartment, arranged in tandem. There was no possibility of stretching your legs during flight. Each flight was carefully planned in advance and personnel were usually too busy to find their situation claustrophobic. The picture is 1200 x 961 at 300 dpi and is from Cybermodeler. 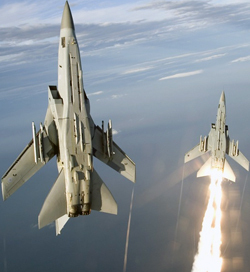 Ejecting from an aircraft flying at supersonic speeds is not safe with a normal ejection seat. 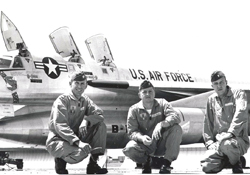 Each crew member of the B-58 was contained within a specially designed escape capsule that was pressurized and provisioned with oxygen, food, water and flotation equipment. Besides deploying a parachute it had a suspension system to soften the landing. This photo is 2560 x 1920 and is at Wikipedia. 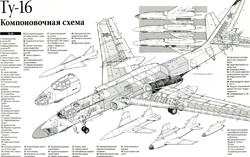 The Soviet's proven ability to down high altitude aircraft was a game changer for the strategic bomber. The stratosphere was no longer a safe haven for high speed aircraft. 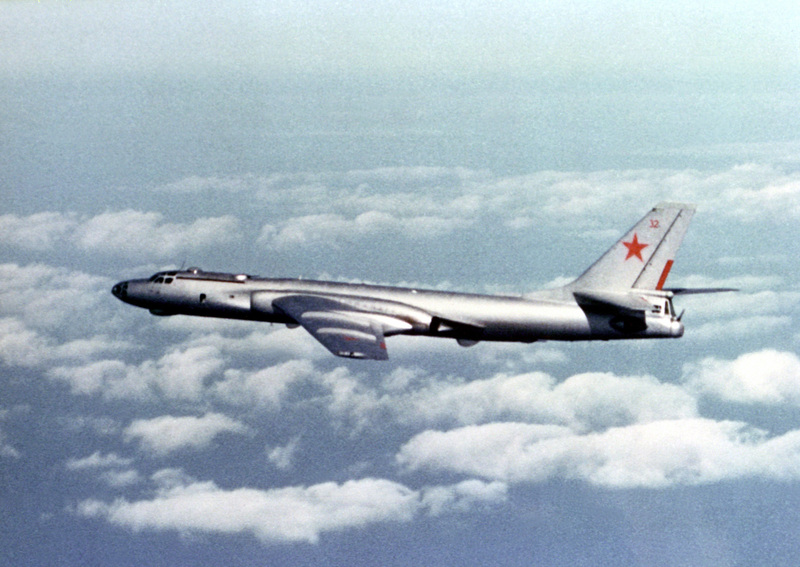 B-58 crews now trained to fly close to the deck in order to avoid radar detection but the dense atmosphere at these altitudes slowed speed and gobbled fuel. 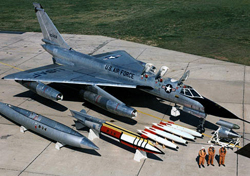 The role of the B-58 was being crowded out with the deployment of solid fueled Minuteman missiles and the launching of Polaris armed submarines. By 1970 all 87 Hustlers were mothballed to the Arizona desert. The picture above is 1659 x 1128 at 300 dpi and is posted at Jet Pilot Overseas. 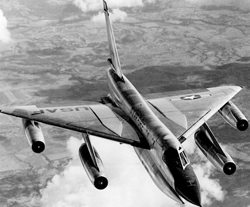 The B-52 survives today because it proved to be a highly adaptable weapons platform, capable of adjusting to changing circumstances and needs. 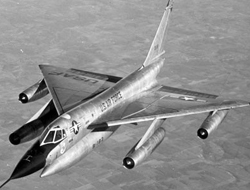 The B-58, on the other hand, was a revolutionary design focused on successfully completing a specific mission. Prior to the deployment of reliable missiles on land and sea there was a strategic justification for the bomber's expense. But while sophisticated defenses can knock most any aircraft from the sky they remain to this day unable to counter an incoming missile attack. The bomber today earns its keep as a tactical weapon in conventional engagements. 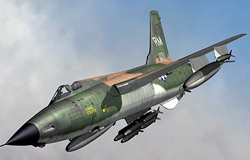 For these missions there are cheaper, more efficient alternatives to calling on the services of aircraft like the B-58. The above image is 846 x 550 and is located at Encyclopedia of Arkansas. 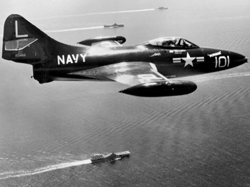 Although the F9F Panther and F-86 Sabre were developed at the same time they were a generation apart because of the reality of landing a jet on a carrier designed to handle prop planes. The straight wing Panther was no competition for the MiG 15 and was limited mostly to ground support during the Korean War. 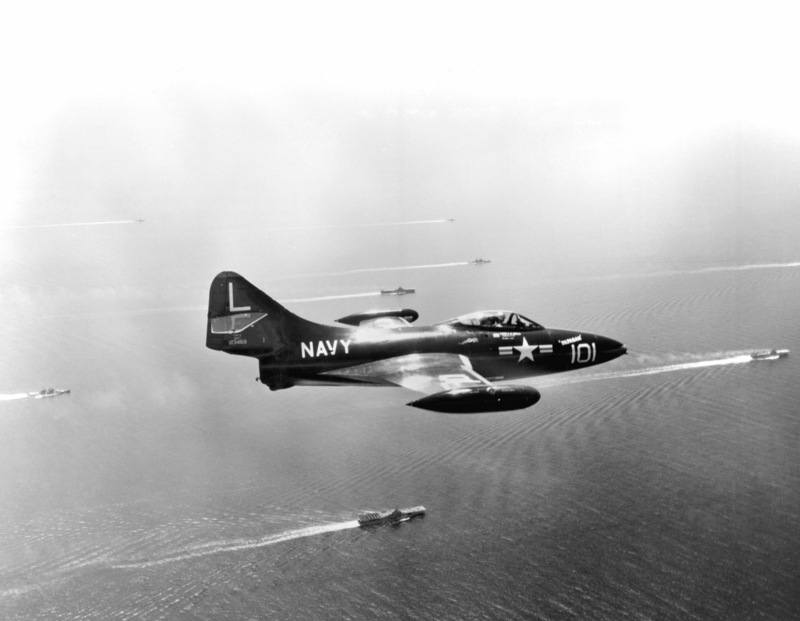 It proved both rugged and reliable as the Navy's first real carrier jet. 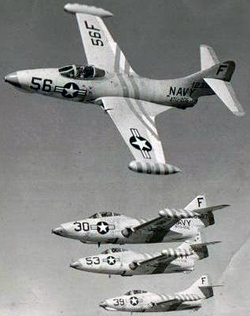 The above 600 x 394 image is from Aviation History. 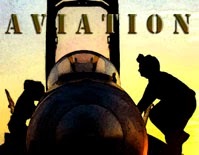 The first years of carrier jet aviation came shortly after the end of World War II when experienced personnel were returning to civilian life and money for defense was drastically curtailed. The war in Korea reversed this dynamic as conventional warfare again became a reality in a time of nuclear deterrence. The atom bomb did not prevent North Korea's invasion of the south nor did it intimidate China when they confronted American forces on the Korean peninsula. An era of wars with limited objectives became the new reality. To Washington policymakers the wars in Korea and Vietnam were not just about blunting the spread of Communism but it also had to do with maintaining credibility. Was the U.S. actually willing to defend Western Europe despite the threat of nuclear war? America's strategic nuclear force was of little threat if the nation's leaders didn't indicate by their actions a willingness to use them. The photo above is 450 x 441 at 96 dpi and is from RC Universe. 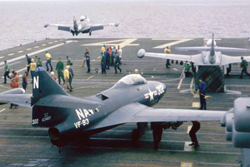 Jet aircraft require far more fuel than their propeller predecessors yet they flew from World War II carriers without provision to make up the difference. This was to be a constraint on flight operations during the course of the Korean War. The photo is 1405 x 866 and is from Wikipedia. In just over two months American and UN troops had been pushed back from the Yalu River along the border with China all the way to the 38th Parallel near the South Korean capital of Seoul. Air supremacy over the battlefield was an important factor in bringing the advance of Chinese troops to a halt. 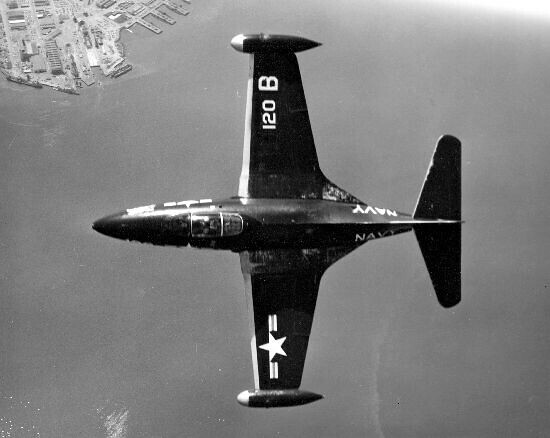 Although the F9F was obsolete in its intended role as a fighter it did prove to be rugged and effective in ground support. The 1772 x 1181 illustration at 300 dpi is from Military Photos. 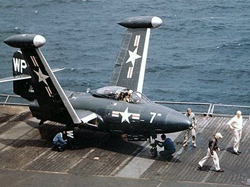 Once the F9F is brought to the flight deck it is launched as quickly as possible. Every minute its jets burn prior to launch reduces its range by 5 kilometers or about 2.5 miles. Catapults were new at the time and limited in capability. Unfavorably still wind could mean reducing ordnance until the appropriate launch weight was met. The hardware was new and new also to the personnel using them. It was on the job training, the school of hard knocks. Yet, it went remarkably well. This photo is 740 x 587 at 96 dpi and was taken in 1950 aboard CVB-42, Franklin D. Roosevelt. It's posted at Wikipedia. 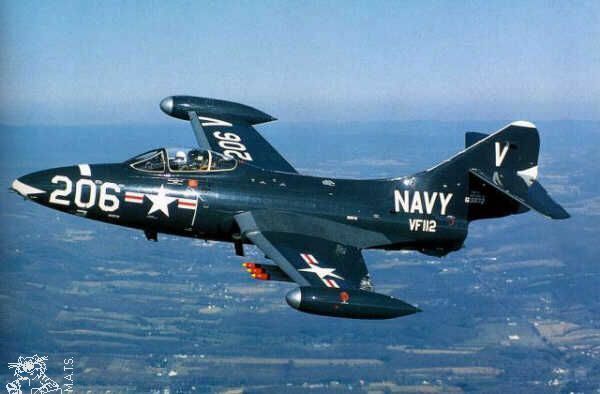 Angling the wings 35 degrees on the upgraded F9F Cougar added another 160 kilometers or 100 miles an hour to its speed. 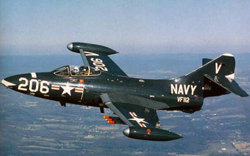 Although the Cougar benefited from an improved engine none of the F9Fs were ever equipped with afterburners. The 550 x 438 image is posted on Flickr. A few short years after the end of World War II a number of pilots found themselves once again climbing into the cockpit. 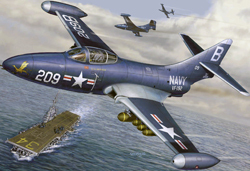 While P-51 Mustangs, F4U Corsairs and Skyraiders were still in use it was quickly apparent that Korea marked the beginning of the age of jets. Now you were flying at twice the speed and given half the time to make life or death decisions. This is a photo of Marine ace Philip DeLong and is 300 x 400 at 300 dpi. 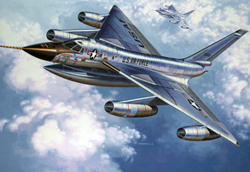 It is available at Aviation Art Store. A carrier is not an airport. It's short, rapid take offs and abrupt landings. The aircraft need to be of lightweight materials yet remain structurally strong to withstand the stress of carrier operations. They need power for speed and plenty of fuel for the ranges required when operating at sea. The design of a carrier jet is the result of finely balanced engineering trade-offs. It is rare to find a plane that meets the expectations of both the Air Force and the Navy. The picture above is 3000 x 2328 at 300 dpi and is from World War II Database. 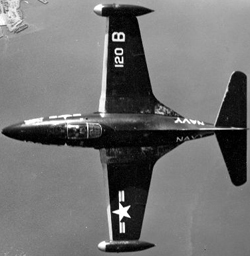 The extended nose on this aircraft and window on the side of the fuselage shows this F9F has been modified for photo-reconnaissance. Close to 1400 Panthers were built and by 1958 they had all been retired. The early days of jets was like the early days of any emerging technology. By the time they were released into active service they were already obsolete when measured against the new aircraft in testing. 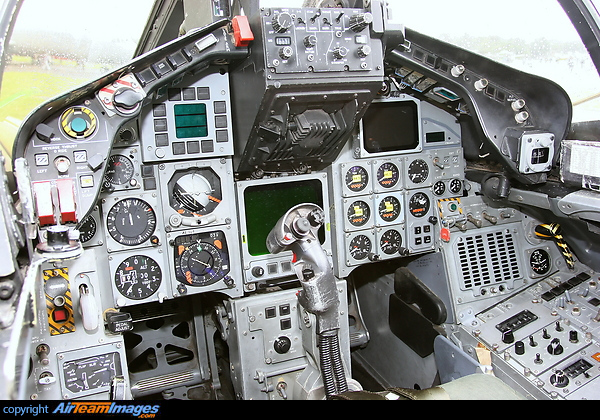 The photo above is 998 x 506 and is at Flight Sim Pilot Shop.